All week long cars have been crashing into each other in the Northeast Kingdom – on the movie screen. Jamie Yerkes, a local film-maker premiered his documentary, "Demolition Kingdom," at Catamount Arts in St. Johnsbury as part of the Green Mountain film festival. As VPR’s Charlotte Albright reports, it’s about the loudest attraction at the Caledonian County Fair – and a group of colorful drivers. (Albright) Sitting in the theater after a screening of his film, Jamie Yerkes remembered how fixated he was as a boy on the demolition derby. (Yerkes) "Well, the fair was a big part of my upbringing. It was the event of the season if not the year. My parents would drop me off probably Wednesday afternoon when it started and come pick me up after the Derby on Sunday night, it felt like. 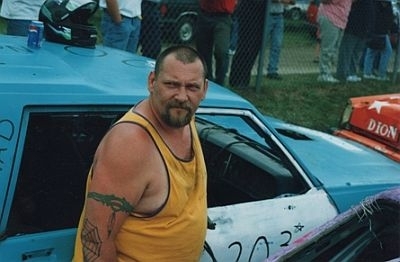 And then the demolition derby was the climax of the fair it was the one that would fill the grandstand, so as a kid, yeah, these guys were sort of heroes, I was like one of the kids in the grandstands at the end." (Albright) Now they are the heroes of his film, Demolition Kingdom. (Hall) "People say I might not make it in the demos but I have a feeling I will-just goes right in one ear and out the other." (Albright) Jeff Hall is a teenager with his heart set on winning the derby, even though he’s never driven a car before. He dedicates his jalopy to his mother, who had recently died from complications after surgery. At the other end of the spectrum, there’s the much envied and dreaded multi-title state champion, Jennie Dion. She enters the film showing off a wall-full of trophies. (Dion) "Lots of times people ask me what is the secret to your success and to me that has been to stay consistent and to use the same kind of a car year after year so I have extra parts, extra tires and wheels and if I have a problem I have the means to fix it". (Albright) Many of the other drivers have a rougher time keeping their cars running, even before they hit the track. But they all get help from friends and family, and that may be the film’s most endearing theme–togetherness, through thick and thin. (Barksdale) "Faces were so real and gritty and it was just great, you know-I liked it a lot." (Albright) That’s John Barksdale, lingering in the audience. Right across the aisle sits the star herself, Jennie Dion. She and her husband and one-man crew, Wayne, are dressed in full derby regalia, and she wears a rhinestone brooch-the logo of her winning car, a Cadillac Eldorado. For Dion, the film sums up life in the hardscrabble Northeast Kingdom. (Dion) "I really loved it because to me it speaks to the heart of the kingdom. In the kingdom, let’s face it, we don’t have tons of recreation of the type that you would see in the cities. Yes do we have outdoor sports, but there aren’t that many racetracks, there are some, everything is spread out so the fair is that one event in the year that draws everybody in. And everybody for ever and ever has always wanted to compete in something at the fair and so I think Jamie has really captured that spirit, that you don’t have to be rich, you can be fairly modest income and you can still do this and people from all walks of life can do this. And it’s important to all those personalities and people from all different walks of life." (Albright) And remember Jeff Hall, that teenager who’d never even driven a car? He didn’t win. (Host) Thursday ends the run for the documentary at Catamount Arts, but DVD’s are available at DemolitionKingdom.com. As head of Kingdom County Productions, Filmmaker Jay Craven has recently renewed a partnership with Catamount Arts, an organization he founded in 1975. Singer-songwriter Neko Case talks with VPR’s Neal Charnoff about living in the Northeast Kingdom, her new album and her upcoming concert for Catamount Arts.